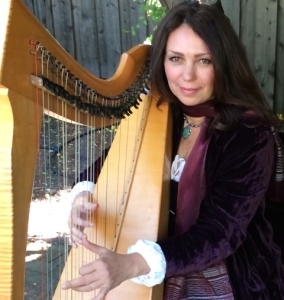 We are very excited about Lisa Lynne offering a class in Harp at Art Camp this summer. She brings 15 small harps with her to share with her students. 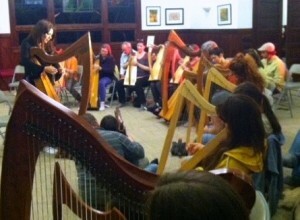 You do not need to own a harp or have any experience to take this class. Celtic harpist Lisa Lynne, has come a long way from her heavy metal days of the 80’s. Unable to break the gender barrier of rock guitar-dom, she settled on the bass – which became her ticket to travel the world and play music. A gifted musician, she soon mastered the instrument and began taking the harp on tour, insisting she be allowed to travel with it wherever her band was playing. 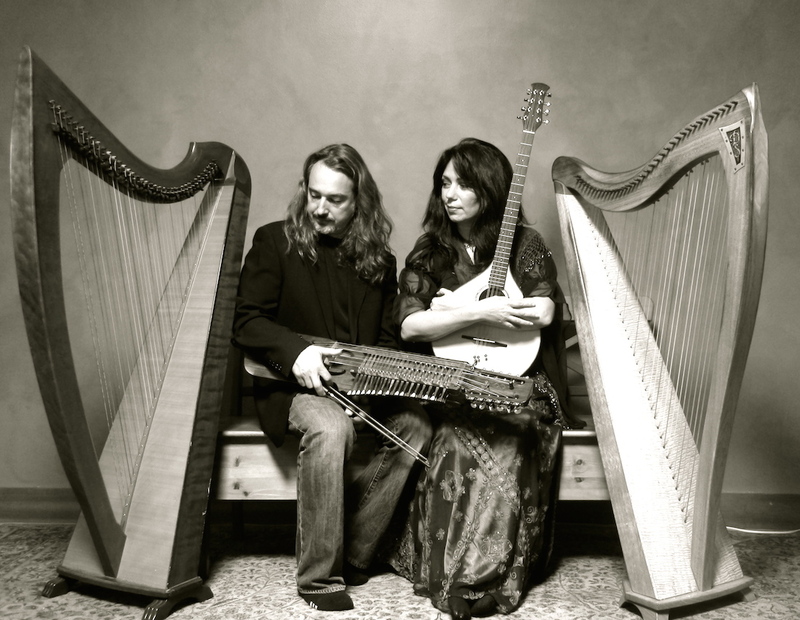 “At the end of our set, I’d open the harp case and strum a few medieval sounding chords,” says Lynne. Claiming the instrument to be very user – and beginner – friendly, Lynne soon set about sharing her harp with who ever was interested. “One of my greatest joys has been introducing the harp to my audience at the biker bars, or military bases I’ve played at over the years. These tough men and burly Marines literally line up to play the harp,” says Lynne. “It’s amazing to watch their hard exteriors melt away. “No matter how you play the strings, it sounds beautiful – every key is harmonious and even the simplest notes sound beautiful. People are astounded at their ability to make beautiful music at once.” So smitten was Lynne by the harp, she gave up all the heavy metal and rock and roll gigs to focus on her new instrument. “I became the wedding harpist, and the restaurant harpist, and started busking on Venice Beach,” says Lynne. She created her own record label and sold close to a half million CDs and cassettes. Yet, even though it looked like Lynne had achieved her dream, it all felt a little bit empty. “I was disenchanted,” says Lynne. “I missed street performing and the up close interaction with people.” Then, Columbine happened and everything shifted. “I was invited to come and play for some of the critically wounded teenagers – a sophomore who loved my music, and another group of injured students,” says Lynne. Inspired, Lisa Lynne reached out to her harp community, determined to provide this young woman, who had been paralyzed from the waist down, with a harp of her own. “The outpouring from the community was astounding,” says Lynne. “It was the first time I felt in my soul that what I was doing was useful. My perspective was forever changed. The harp became a symbol of hope and a future for this young person. As time progressed, Lynne kept having these profound experiences and knew she was on to something. From bikers, to Marines, to elders in a group home, sharing the harp with the world, especially with those struggling with life and death matters, became her life’s work. She soon got clear on her mission, which immediately opened a path for the universe to provide. “I started to write letters to hospitals and rehab facilities,” says Lynne. “The first response was from City of Hope – a reknowned cancer research hospital in Los Angeles. Not only did they want to participate, they wanted to create a whole music program and had the funding and resources to buy some small harps for their patients. “This positive outpouring of support took me by surprise – I was asking for and receiving all the support I needed because of how right this endeavor was. Soon Lynne found herself considered an expert of music therapies, speaking along side PhDs and medical professionals about the impact of music on healing. Numerous grants allowed her to expand the program, and as her visibility in the media and news expanded, so did an increased awareness of using music in healing. Many new hospital programs were inspired. After toiling along the New Age charts in the mid-tens during her “professional” career, Lynne had never had a Top 10 breakthrough, however, still under contract with Windham Hill, she owed her label a record. “I no longer cared about the “silliness” of chart rankings, and submitted an album of lullabies – knowing it was not very commercial,” says Lynne. After going full steam with her hospital music programs, her newest record went to #6 on the billboard music charts. Today, her program has extended beyond hospitals and schools to creativity camps, including this year’s Feather River Art Camp. “It’s a match made in heaven – between what I do and the healing power of art – especially in a beautiful and natural setting,” says Lynne. “You’ve got this resonating column against your body. It never fails to uplift and inspire. I can get a group playing beautiful music together in very little time. No experience is necessary. Complete beginners can take this class. Harps are provided for you to play. Check out Lisa’s class at Art Camp here.